Labor Day is upon us, which means that vacation homes will soon be at capacity as owners and their houseguests come by car, plane and ferry to celebrate the best of the extended, if bittersweet, weekend. To honor this more-the-merrier outlook, we showcase eight gorgeous great rooms. The following come-hither open-plan living spaces are where the action is—at least, when revelers aren’t on the beach, boat or terrace. This stunning room on the Vineyard, overlooking Squibnocket Beach in Chilmark, is part of a family compound conceived by architect Patrick Ahearn, FAIA, and built by Colonial Reproductions, Inc. With its transom windows that bathe the room in natural light, French doors, tray ceiling and a chill palette of white, ivory and sand tones, the living area has as an unmistakable air of refinement and yet a subtle beach vibe. 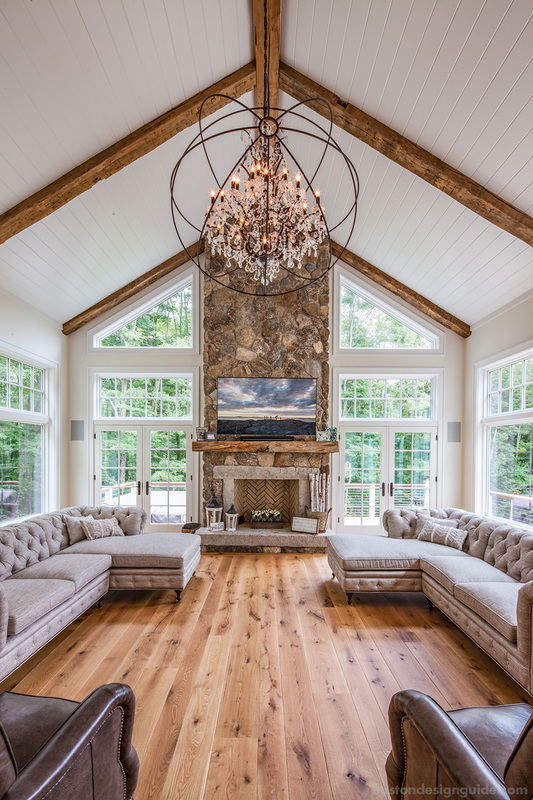 We love how the back-to-back sofas and dual chandeliers create two forums for conversation: one section boasts a living-room feel, while the other, by the stone fireplace, is slightly more relaxed. 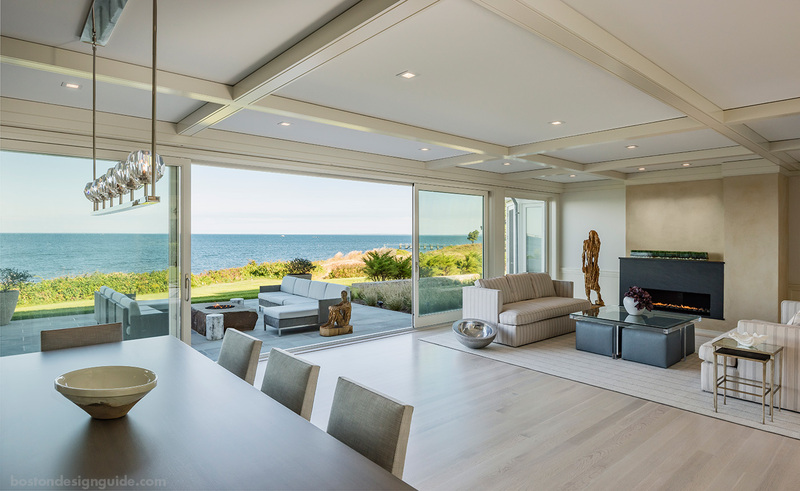 This transcendent living space belongs to a sparkling new South Dartmouth construction overlooking Buzzard’s Bay built by Parker Construction Company. The client was so enamored with their seaside vantage that they couldn’t face moving, so they razed their existing home and built anew—all within a nine-month time frame so as not to miss a single summer. You can bet that this chic, minimalist great room, which opens to a deck and a landscape design by Gregory Lombardi Design, receives maximum raves this Labor Day. This custom great room, by Thomas J. O’Neill, Inc., seamlessly carries the colors of the sea and sky indoors, not to mention the horizon. This tranquil space exemplifies the design/build and interior design firm’s love of clean lines and traditional accents, stopping all who enter in their tracks. Though firmly grounded, the turquoise tides at the foot of this home give the setting a cruise-ship sensibility. 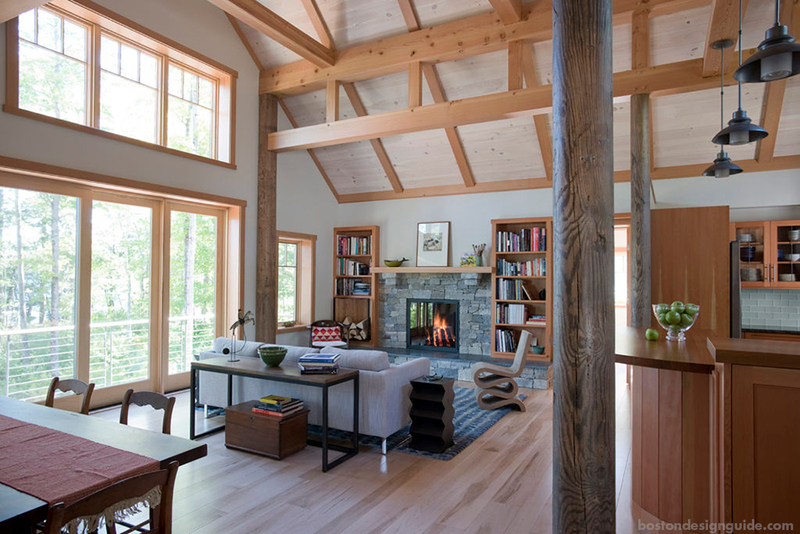 A contemporary timber frame great room in Holderness, N.H., was designed and built by Bensonwood to have four-season staying power, and features this open-plan great room and abutting kitchen, as well as a Port Orford cedar timber frame screen porch. Its Squam lakefront locale meant that the two-story home, which is laden with Douglas fir timbers and contrasting round posts, and eastern white pine on the ceiling panels, needed to commune with its natural environment. Bensonwood, of course, wouldn’t have it any other way; founder Tedd Benson, built the off-site fabrication home-building company on a foundation of “honest” timber framing and sustainability. 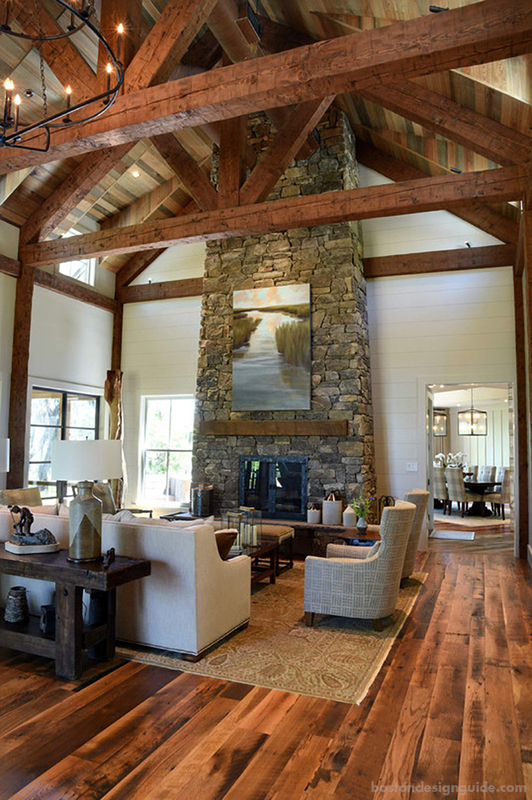 Rustic yet elegant, this high-ceilinged great room crafted by Concept Building has an atrium feel and a pleasing symmetry. A soaring stone hearth, detailed with a reclaimed wood mantel and a herringbone firebox, dominates the spacious room, as does a feeling of warmth despite its scale. We are smitten with the facing tufted sectionals and how the chocolate leather armchairs bring out the character of the burled flooring, while the white shiplap overhead keeps the mood light. Chatham Interiors’ serene gathering space, which opens out to a deck, celebrates the wooded vistas framed by its peaked wall of windows with its understated color palette of dulcet neutrals. 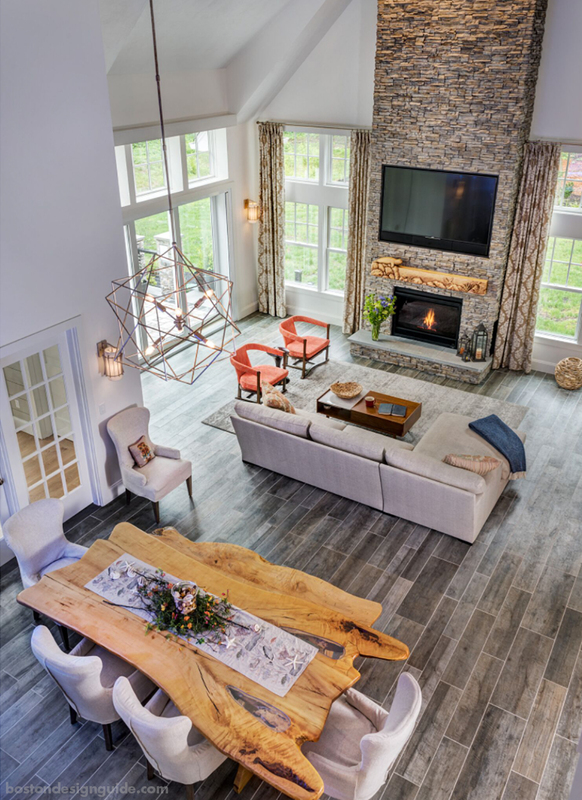 Comfort, as well as a kinship with the great outdoors, is king in this multitoned hangout space that invites guests to sink into plush seating and stay awhile. 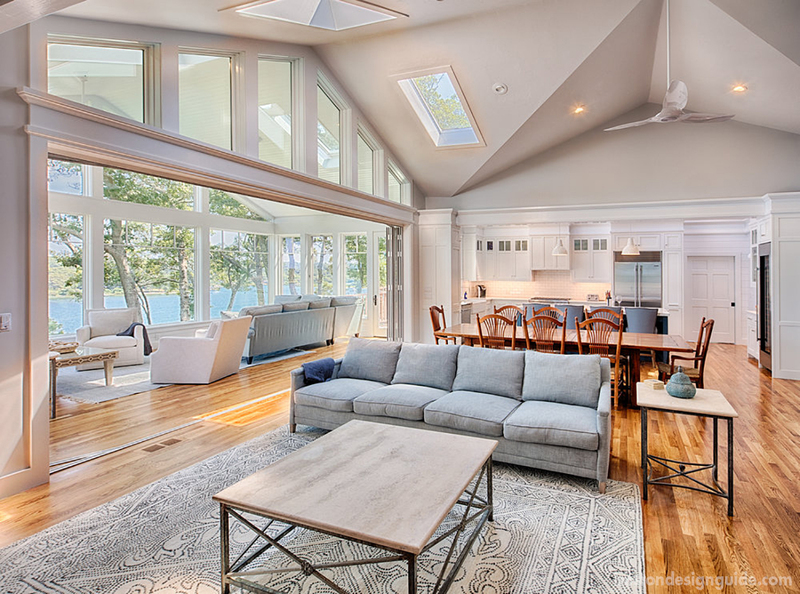 Interior designer Donna Elle gave a “citified, mainland” sensibility to a great room on Narragansett Bay, imbuing the lofty space with plenty of texture and movement. Elle took her design cues from the clients, who have a deep reverence for nature, and found a live-edge maple table made from a fallen tree during Hurricane Bob to echo the carved wood mantel the homeowners had purchased. Elle opted for earthy and sunset hues (like those fantastic orange chairs!) over the blue tones of the bay, and also took comfort into account. As the residents are big TV watchers, Elle specified a 35-degree pitch for the A. Rudin sofa, ensuring optimal—and ergonomic—viewing of the screen over the fireplace. Rob Bramhall Architects’ great room for a South Carolina retreat captures the spirit of Southern hospitality and charm. As the centerpiece of this home, the living room reflects the natural materials of the landscape, fitting in seamlessly with its environs. 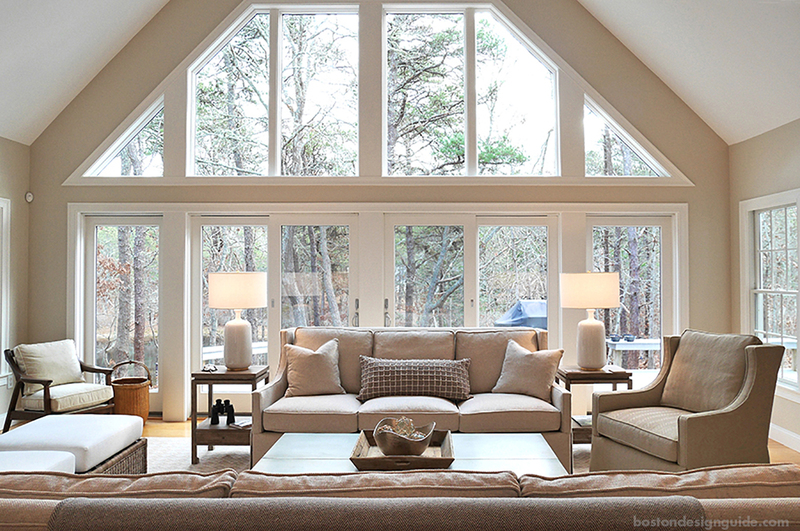 Though it has sky-high vaulted ceilings, the living space is given a cozy bearing due to the interplay of rich woods. The gorgeous grain underfoot is answered by hardy beams and a variety of wood tones above, and the creamy, painted wood lining the perimeter has a neutralizing effect.